It’s the time of year to wax nostalgic about old times and old loves and dear ones gone by. Every song, every scent, every email seems to pull at the heartstrings. Like this one from Marcello: “What kind of humidifier you had running in the living room? I need to find a good humidifier.” And suddenly I’m back in 1998. Bemis Tabletop model, you were my first grownup humidifier and I’ll never forget you. You made me realize what was missing in the cheap Walgreens models I bought and discarded, only to re-buy and re-discard. I immediately connected with the wicking system, and when I opened my first bottle of bacteriostatic treatment, suddenly everything made sense. But Bemis, though you changed me, or maybe because you changed me, I outgrew you. The upside down water tank thingy, it started to grate. I’m not accusing you of spills, but the whole idea of it, the slightly squishy experience of picking up the tank, turning it over quickly to avoid excessive drips, and then filling it and having that sinking feeling when I had to turn it upside down again, it started to outweigh the humidification highs. And no, the top never came off. But just knowing that it might, Bemis, just knowing that it might. Then we moved into a house with the driest heating system of all: hot water radiators. I couldn’t appreciate the irony of all that hot water being so near, but completely closed off, until my first bloody nose. I briefly wished for steam radiators, but after one night with Essick 4-Speed Mini Console I was like, Steam who? This time it’s forever. To fill Mini Console, you don’t deal with any upside down water tanks. You don’t worry about drips and spills. You just take the top off and fill. You can even use a bucket (a clean, new, dedicated bucket is only like four bucks at Matty K’s), to transport the water so you don’t even have to pick up Mini C and move it into the bathtub. If you just fill it with a bucket a day it never becomes a big chore. And I find this model also sort of fades into the room. It’s actually less noticeable than the Tower model. Tower, also an Essick, was a huge mistake, but I’m living with it. Big brother to Mini Console, Tower seemed like it would be less noticeable and would humidify better, but no. It’s got upside down tanks, two of them, which are even more prone to spills and drips than Bemis Tabletop. So you’re paying more for something bigger that doesn’t last longer and is more of a pain. Last thing: Make sure you purchase the bacteria treatment, and put in about half a capful every time you fill the humidifier or the bucket. This is crucial. Really important. And new filters every year. You can get both of those at Matty K’s too. 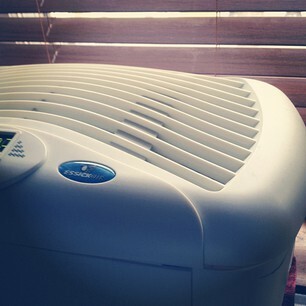 Oh, don’t be fooled by the Venta Air Washer humidifier. My mom gave them whole years of her life and they only caused her heartache. And backaches. Yeah, I got into it with Essick Tower the other day. I think he’ll be departing soon, but I’m giving him a few days to pack his things. Is there anything more magical than a clean, new, dedicated bucket? Either you’re getting me back for ruining Christmas, or you are the only person west of the Rio Grande who really, really understands me. Whew! Glad you guys are still happy.